Dancing at Canyon Dance Academy my entire childhood, I studied a broad variety of dance forms and technique methods. More importantly though, I developed crucial life skills in the dance studio. My instructors at Canyon Dance Academy not only encouraged me in the skills I learned more quickly, but emboldened me to challenge myself. I learned that just because something was difficult, didn’t mean it wasn’t worth trying. Over the years, I also developed a firm rapport with my fellow dancers of all ages. In the performance setting, I always felt that although there were many different experience levels present, the littlest nutcracker mouse was treated just as kindly as the Sugar Plum Fairy. The dancers at Canyon look out for each other, supporting each other to overcome obstacles in and outside of the studio. Canyon Dance Academy provided an environment where I could really explore different dance styles. During my time at Canyon, I learned contemporary ballet, pointe, several styles of jazz, modern, and contemporary, and took workshops in ballroom and hip hop. Additionally, my instructors at Canyon connected me to opportunities and resources I wouldn’t have otherwise found and worked with me to develop materials to strengthen my college applications. Dancing with VELOCITY Dance Company, I performed at an extensive variety of different venues and events and had the opportunity to perform solos and choreograph. 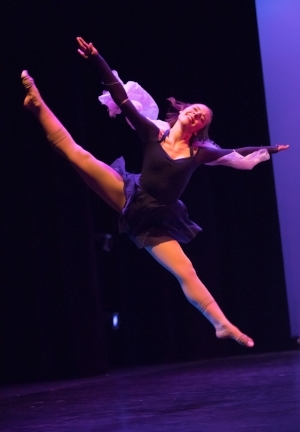 Canyon Dance Academy is an exceptional studio because it allows students to flourish in their individual ways, emphasizing a fusion of technique and creativity. The instructors also truly care about their students. My instructors infallibly gave me highly personalized feedback helping me to set goals and push myself. I would absolutely recommend Canyon Dance Academy to any dancer or dancer-to-be of any age. You won’t regret joining this encouraging and convivial community. Canyon Dance Academy has been like a home to me. For the past six years since I started dancing at Canyon Dance Academy I have seen nothing less than pure passion for not only dance but the students learning. I came to Canyon Dance as a clumsy twelve year old; with the help of the faculty and staff I was able to blossom into a beautiful young dancer. I had an excellent experience dancing and assistant teaching at Canyon Dance Academy. I can’t thank Canyon Dance Academy enough for all the love and support they have given me, with the help of my dance studio I feel prepared to go face the real world bringing my love of dance with me. I hope one day all dance studios can share the same compassion for the community as Canyon Dance Academy does. My decision to take dance class at CDA was one of the best things I ever did for myself. I was 14 when I first took Hip Hop class with Miss Jen; I liked it so much I took B-Boy classes also. The friends I made at CDA and my teachers there, especially Mr. Luke, made a positive impact on who I am today. Dance will always be a great part of my life thanks to CDA! My son does one class (that he loves) at CDA, but it was truly impressive to see the effort that such a diverse group of young people put into the big year end performance. I think that the commitment and hard work these kids demonstrated speaks to the good job CDA does and the service the provide to the community.